Children have an innate dislike for any food termed as “healthy”. And knowing my kids’ aversion to some healthy veggies, I have acquired dexterity in concealing nutritious vitamin enriched veggies in the eatables of their liking. 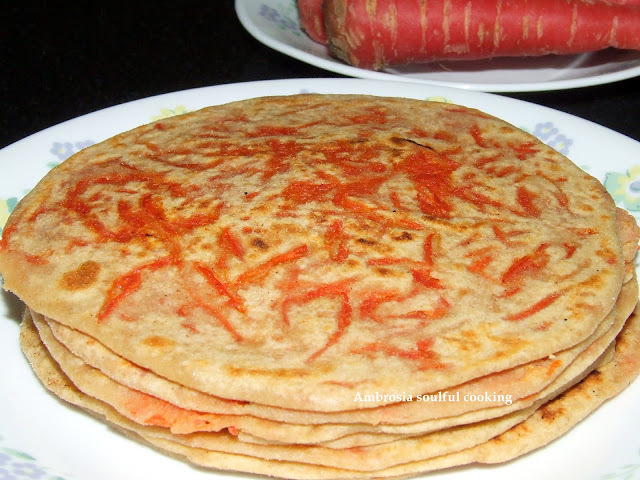 And in this quest for making healthy food for them, I “invented” the recipe of Carrot Paranthas. Carrots are loaded with vitamins. Carrots are rich in beta-carotene, which is converted into vitamin A in the liver. Beta-carotene has also been shown to protect against cataracts. A high level of beta-carotene also acts as an antioxidant and prevents cell damage. Vitamin A and antioxidants protects the skin from sun damage. Thus preventing premature wrinkling, dry skin, pigmentation and blemishes. Research has shown that diets high in carotenoids are associated with a lower risk of heart disease. Carrots have not only beta-carotene but also alpha-carotene and lutein.The regular consumption of carrots also reduces cholesterol levels because carrots are high in soluble fibers. Some dry flour for rolling out paranthas. Squeeze out the juice from the grated carrots. Use this juice to knead dough. Mix whole wheat flour and salt. Add carrot juice and warm water and knead dough. The dough should not be very soft. Let the dough rest for a minimum of 30 minutes. Take a lemon sized ball of the dough, press it between palms, apply some dry flour and roll out a small circle. Add a table spoon of grated carrots, sprinkle a pinch of salt. 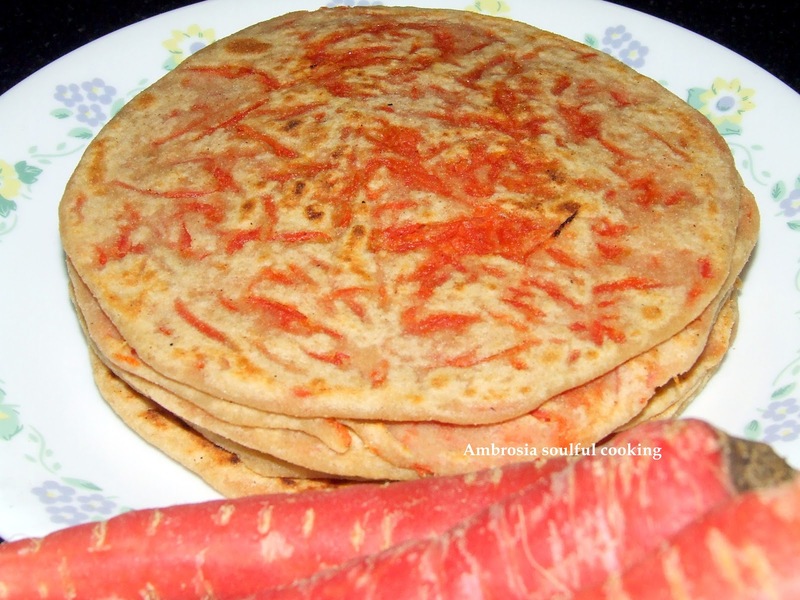 Cover all sides and roll gently to make a chapatti. Heat the tawa (griddle) and put the parantha on the tawa. When golden specs begin to appear on the lower side, apply a teaspoon of olive oil and cook till golden and crisp. Repeat on the other side.